Where was God when a deadly tsunami swept through the Indian Ocean killing nearly 250,000 people? And where was God when hurricanes crashed against the Gulf Coast leaving hundreds of thousands of people homeless and without hope? Was God there? Does He care? In the wake of such incredible loss and disaster, we struggle to understand how a God who is all-powerful and all-knowing can also be considered good and loving. Pastor and teacher Erwin W. Lutzer tackles this tough subject head-on, offering real answers as well as comfort and hope to those who struggle with these challenges to their faith. 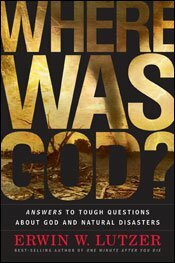 In doing so, he addresses the questions we all ask, including: Are natural disasters acts of God? Does God care about what happens in this world?